With a rose, the nearest petal hides from our view all of the other petals and structures that lie beyond it, so much of the beauty of the blossom is hidden. With the penetrating power of the X ray, floral radiographs reveal all the details of the successive layers of petals and other structures. 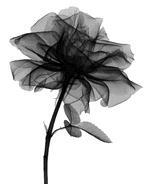 No chemicals are introduced into the flower nor is it harmed by the small exposure to X rays. In a radiograph of a Cup and Saucer Campanula, that portion of the saucer that lies beyond the cup registers clearly, but it would not have been seen by an observer nor would it have registered on a photograph. A drop of water can be seen at the lower edge of the saucer and to the right of the stem. The radiograph of the Iris reveals not only the beauty of the Standards and Falls, but also reveals the contents of the Bud and Ovules. About forty years of experimentation with this unusual art form has led to its present high degree of excellence. Floral radiographs literally provide one with a third eye with which to see and appreciate the beauty in the secret garden of flowers.